Tornado shelters are more than just a movie prop, they are a vital part of any disaster program in areas that are prone to tornadoes. 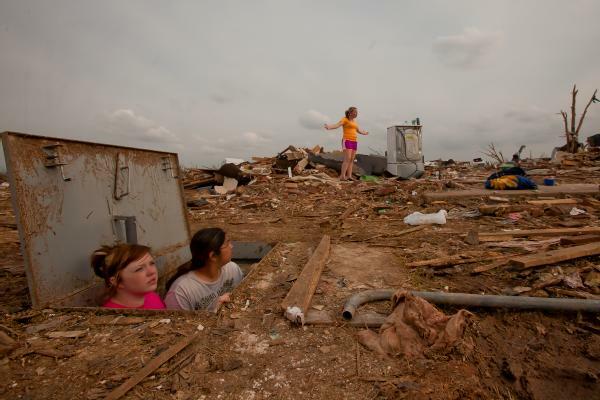 These structures, if designed properly can save lives when a tornado strikes. Having a shelter that all members of the family know about, and plans for getting to it quickly are important when a twister approaches. Underground: These structures are normally the best for offering protection from a twister and many other types of disasters such as hurricanes. It is best to construct the walls using material like steel or concrete. The main drawback is that it may be difficult to get to without ample warning beforehand. A safe room in your house: The design and location of this can vary, but it should be structurally sound and made from reinforced concrete, steel or high quality wood. If you are building a new home you can actually build an underground cellar to use as a bunker in the event of a windstorm. This can also double as a storage area. A Pre-constructed unit that you can buy: Many people find these convenient and it is easy to get one from a reputable company. Some buyers choose to place them inside the house. They should ideally be on the ground floor and properly attached to the building’s foundation so that they are stable. Other areas in your home can be great tornado shelters in a disaster, but you need to make sure they meet the requirements. Look around your house and see if these rooms can provide covering and protection if a twister hits. Bathrooms: These are ideal if they have no windows or don't share an external wall with the house or building. Contrary to popular belief, getting into a tub with a mattress will not offer enough protection as it all depends on the strength of the twister, and the structural strength of the bathroom and tub. Under Stairs: If this is in the interior of the house and away from openings such as doors and windows, it can be an ideal spot. In addition, even if there are windows, but they are higher than the space under the stairs, you should be safe from projectiles. Closet: If these do not share a wall with the exterior of the house, or have windows and doors to the outside, they can provide protection during a twister. Hallways: To be effective the hallway has to be away from windows and doors. Since it is not a good idea to be out in the open during a twister, the best thing is to find areas in your home that can provide cover until the storm is over. If you choose an underground structure that is away from the home you may be in danger from objects and trees than can fall on you when you pass them. It cannot be too far from the house, so it will be easier for you to reach it. The ages and health of persons living in your house. People with mobility issues may not be able to make it safely without assistance; (putting you all in the path of flying debris). Your areas’ water table as this will determine the suitability of building an underground structure. The type of material you will use. The weather conditions, as wood may not be ideal for areas prone to heavy rainfall. If your home is built (or part built) from brick or concrete block, you should NOT build your shelter near to your home. If the building should collapse on top of your shelters door you may not have the strength to lift the door and the debris - leaving you buried. Tip - always ensure you have a mobile phone and an old car-jack in your shelter. The best thing is that they can come in handy in other types of disasters as well. Whether you build or buy one, it should meet FEMA or other international standards. Once it does, you will know that the material and workmanship are of high-quality and that it will offer the protection you need. As long as you live in an area that can get these storms, thinking about tornado shelters makes sense.